This lady bird had emerged just a few hours before I discovered it on low-growing foliage of Goodding's Willow -- Salix gooddingii at Hassayampa River Canyon, sw. Yavapai County, Arizona. It had moved less than 2 cm from its empty pupal case. Surprisingly this beetle may appear in the color shown or else jet-black with two red trapezoids on either elytra(hardened wing covers). The immature stages of lady birds are predacious larvae that can be found on willows and other plants in the Sonoran Desert. They are most common in riparian zones. They feed on aphids and other soft-bodied bugs such as psylids. The ashy-gray lady bird can also be present in cultivated alfalfa fields in the Sonoran Desert. 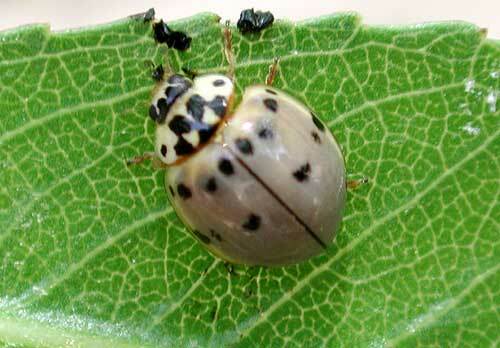 Ladybirds are also commonly known as ladybugs, but because they are beetles most entomologists avoid this name. In beetles the first pair of wings is hardened into a shell (elytra or elytron (singular) of sorts that can be folded out to reveal the more delicate flight wings beneath. Beetles differ from bugs also in that they have four distinct life stages: egg, larva, pupa and adult, whereas bugs only egg, nymph and adult.